Four exciting activities in one, plus all day at our beach club afterward! Now that is a full day of fun in Playa del Carmen. Ride your ATV into the jungle to a hidden cave. Here we'll explore inside using flashlights and helmets to see the interesting limestone formations. 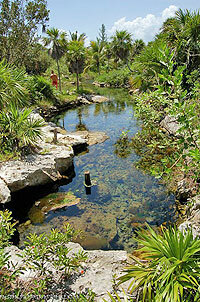 Drive deeper into the jungle where we stop at a cenote (freshwater pool) where we can rest and cool off with a swim. Back on the ATVs we'll ride to the beach, where we'll hop on wave runners and zoom across the clear blue waters of the Caribbean Sea. We'll stop for snorkeling on one of the most beautiful coral reefs in the entire Riviera Maya, flush with tropical fish, sea turtles, and eagle rays. Relax on a virgin white sand beach enjoying delicious ceviche, then cruise back to the beach club, where you can use the facilities the rest of the day including restaurant, bar, lounge chairs, and umbrellas. ATV Tour to a Cave and a Cenote in the Jungle! Jet Ski Tour to a Virgin White Sand Beach! How Long: Tour is Approximately 3.5 Hours, but you can use the beach club all day long. Optional: Gallop on the beach! Experienced riders can have an opportunity to gallop your horse along the beach for $13.50 per person extra. Solo each person has their own ATV and their own Jet Ski. Shared 2 people will share the jet ski. Minimum 2 people for the shared option. Includes All Taxes and Fees.